Now that I'm done pitching the article, it's time to play some video games. Leg It has one of the simplest concepts ever, just keep hitting a button to run and see how fast you can manage it. Then retry and attempt to beat your score again and again until other people you live with demand access to the computer. Is it an especially deep game? Don't be silly, it's a bash-the-button-to-run-fast game. Is it fun? Yes, and it actually has a surprising amount of replay value; certainly more than I would expect from a game that revolves around trying your best to break your R key. 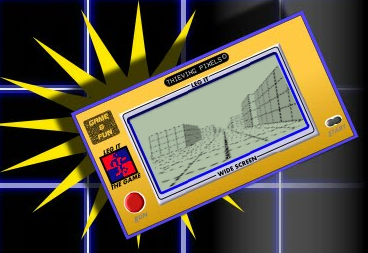 The 3D graphics are neat and fit in with the faux-handheld theme without looking too high-tech. Zombie is a more complex game, set inside a similar make-believe plastic handheld to Leg It, featuring basic first person shooter movement (in the vein of Wolfenstein 3D) around a single cuboid room with zombies coming through the walls. The zombies, by the way, are the things that look like walking doors; and I'm ashamed to say my first run through of the game began with me trying to get through one such "door" before I realised it was trying to kill me. Anyway, fancier graphics for the zombies would have really broken the illusion that you're really playing a handheld game that would have been the instant subject of earnest junior school assemblies circa 1993, and the doorzombie things are more than scary enough when you're surrounded by them. The requisite moans and groans are used to creepy effect in the minimalist, moody soundtrack and the scoring system punishes trigger happiness with points docking for missed shots. Gameplay takes a reasonable amount of time to get hectic and deadly, and by about four "nights" into the game (I'm not quite sure how it measures the passage of time, I was too busy playing it to get the stopwatch out!) dying is easy, and carking it in this game makes for a satisfying, guns-blazing, swamped by grey monsters zombie movie death. Zombie isn't a finished game though, and there are a few kinks that could do with being ironed out. The scoring system counts all bullets fired as wasted, for example, although it seems only to penalise the player for the ones that don't hit the target. Having every shot you loosed at the enemy listed as a wasted bullet in the post-game post-mortem isn't exactly the worst thing to ever happen to a video game and apart from scoring issues, there doesn't seem to be a lot keeping Zombie out in the wilderness of part-developed games; although as far as I know there may be hundreds of creeping bugs under the surface that programmer Ben 'Thieving Pixels' Simms wants exterminated before posting a finished product. Whether or not Zombie gets its final coat of polish it's still a great casual game, and Leg It stands firmly beside its undead friend as a cracking, satisfying time waster, albeit one that risked permanent damage to my keyboard. Download the game here (from Ben Simms' site). Anyway, I've just finished another little project in the same vein as these two games, which I think you'll love. Once a again it's a pseudo LCD game called 'Blasted Birds'. Again, it has a really simple concept, one button action and a slightly modern twist.